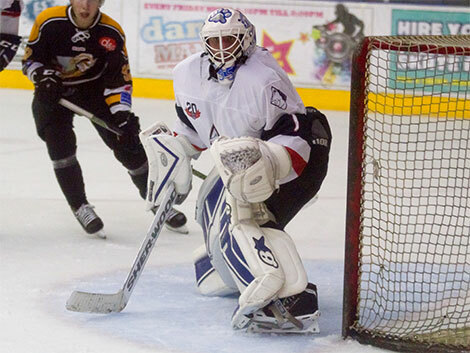 The Invicta Dynamos are pleased to confirm that 28 year old shot stopper John Dibble has transferred to the club from the Bristol Pitbulls to continue in net as a result of ongoing injuries to Damien King and James Richardson. The Mos two netminder’s both suffered injuries in October’s home game against Streatham leaving the side without a goalie resulting in Head Coach Kevin Parrish calling upon veteran Glen Rodbourne and borrowing John Dibble from the NIHL South Division 2’s Bristol Pitbulls. Dibble has since featured against Chelmsford, Bracknell and Streatham and came into the weekend with a 96.10 save percentage from his first two home games with the Dynamos. Now the shot stopper, who was in his eighth consecutive season with his home team in Bristol, completes a switch to Kent allowing him to continue providing cover over the coming weeks. Speaking on the news Head Coach Kevin Parrish said, “John has come in and done an excellent job for us when we needed it most so I’m delighted he has agreed to carry on helping us out. He had a very good reputation in Bristol with the Pitbulls in the NIHL South Division 2 and I think in recent weeks he has proved he is also more than capable in this league as well. We’re grateful to John to moving over but we also owe a thanks to his Coach Richie Hargreaves in Bristol for allowing him to come and play for us”. John Dibble will continue between the posts for the Dynamos over the forthcoming weeks and will feature in his second road game against the Oxford City Stars on Sunday before a trip to the London Raiders next weekend and a home clash with the Milton Keynes Thunder on Sunday 20th November.